Design of an interactive second screen companion that compares the television docudrama series, American Crime Story: The People vs. OJ Simpson with interviews and archived media of that time period (television broadcasts, print, etc.) Masters' project includes designing the UI of the companion app, collecting media, and interviewing several potential users to test usability of the prototype. Also visit the documentation website for more detailed information and check out the prototype. Tiffanny Goodman is a playwright and author previously based in Saginaw, Michigan that relocated to Atlanta a few years ago. She wanted to restart her creative career and begin a platform for her public advocacy efforts to give a voice to parents who lost children to crime. She has an existing website but we needed to remove elements that she didn’t need, especially unnecessary widgets that watered down her branding - known as “feature creeps.” We began with low fidelity prototyping, and now the website is refocused on her writing and community service. BindexT is a venture founded by entrepreneur Monica Hooks to develop a data analysis tool to discover social media influencers through the topics where they lead the conversation rather than who they are on the surface. The project was pitched to the Hackathon event to primarily find developers who would be interested in scraping data from Twitter API for sentiment analysis with designers to create a prototype of the physical product. My individual role was designing the UI with visual assets based on Monica’s vision of BindexT as an easy to use, non-corporate tool. After the weekend-long event (October 13-15, 2017), our team won 2nd place! Upon hover, more information about the influencer appears on the page. Collaborative Project with Karan Pratap Singh, Sharon Lee, and Shawn Wu for eTV (Experimental Television Lab - now known ad PeN Lab) @ Georgia Tech. Heads-Up is a Google Glass prototype that functions as a translucent second screen over the television while re-watching a favorite show. Our project focused on HBO’s highly acclaimed series, Game of Thrones. My role was background research on different uses of wearable and television technology and creating visuals for the user scenario. 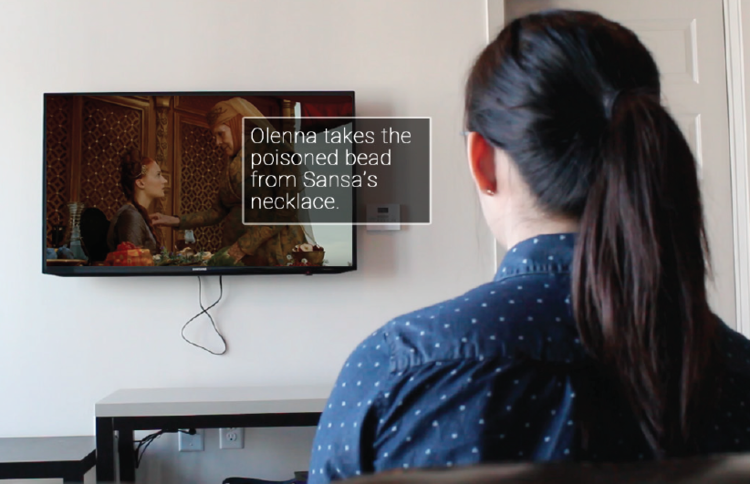 Wearing Heads-Up allows the user to continuously view the TV screen while receiving synchronized commentary through Google Glass’ translucent screen rather than be distracted by a computer, phone, or tablet. The comments will appear solely on the Google Glass and will point out key plot points that may have been missed during the first viewing. If watching a TV show with a friend who has not seen the episode yet, Heads-Up will not spoil the plot since all comments appear on the Google Glass screen that only the user can see.